Home » Product Updates » Our Android App Just Got an Update! 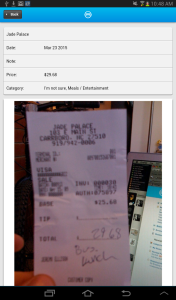 A new version of the Shoeboxed Receipt & Mileage Tracker for Android is now available in the Google Play Store. Go get it! The new app pulls in all receipts from your Shoeboxed account so you can easily search for receipts from any source – app, Magic Envelope or email – on the go from anywhere. Please note that once you download the new version, you’ll need to log in again. We apologize for any inconvenience, and we hope that you enjoy the upgraded Shoeboxed experience on Android! As always, feel free to let us know if you have any questions about the new Android app. We’re available 24/7 at help@team.shoeboxed.com and @ShoeboxedHelp.